Want to add a little interest to your scrapbook page? Make it jump off the page with a DoublePhoto. This neat little accordion fold trick lets you squeeze two pictures into one, and whoever is looking at your page will pick up the scrapbook and hold it up in the air, just to see the picture from both angles. Now drag the two cropped images from Explorer into the placeholders in DoublePhoto. If you're happy with what you see, click Save. Next, send the file you generated to the printer. (I usually do this using Windows; just click the Print button from the preview window you see when you double-click the file.) If you're using an inkjet printer you should let the ink dry a bit before continuing. Next you'll need a straightedge and something to scribe the folds in the image. I use a rotary cutting/scoring set from Fiskars, but a ruler and a sharpened dowel (think "pointy stick") or similar scoring tool would do just fine. Line up the ruler with each of the boundaries between the two photos, and apply some pressure while you pull the pointy stick along the line. Now carefully fold along the scored lines, in alternating directions, so that the photo ends up looking like an accordion. 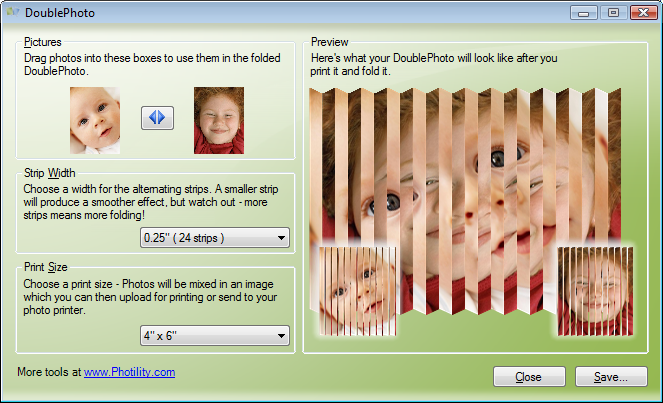 Finally, attach the DoublePhoto to your scrapbook page, add your usual embellishments, and enjoy the reaction you get!